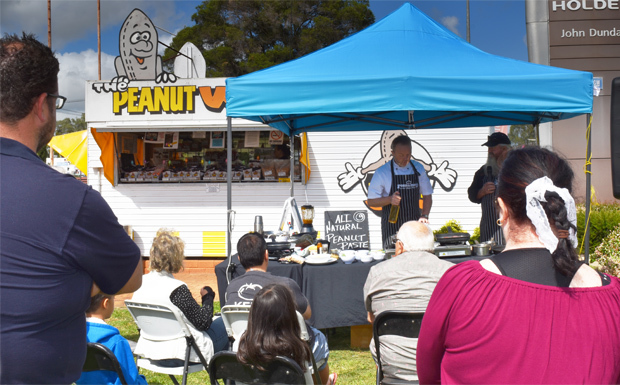 Jason and The Peanut Van’s Rob Patch set up a marquee next to the van in Kingaroy to prepare some classic peanut recipes which have featured in various peanut-themed events over the years in the South Burnett. 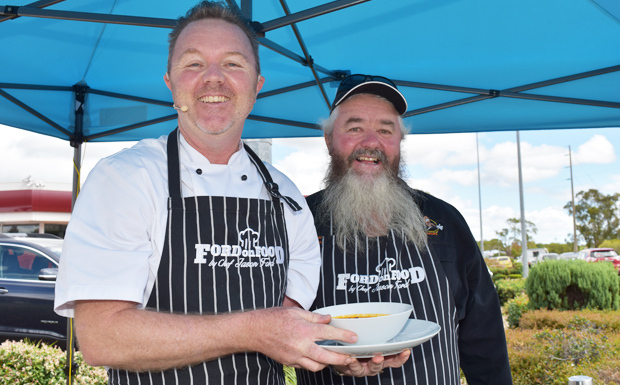 The pair have appeared on stage several times in the past … at the Kingaroy Peanut Festival, Wine and Food In The Park and most notably at a charity dinner, “Nuts On The Range”, held at the former Belltower Restaurant which raised funds for Relay For Life in 2006. 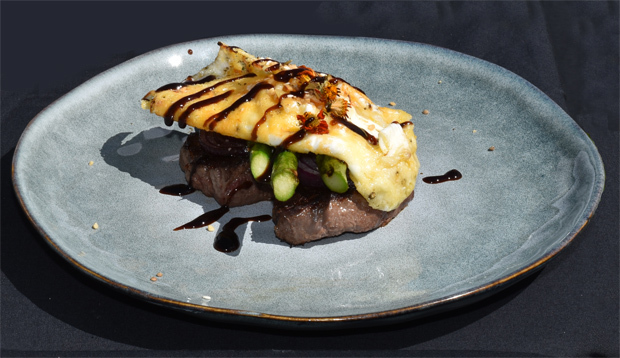 The recipes prepared on Friday were Jason’s famous Spicy African Peanut Soup, a Peanut and Buttermilk Panna Cotta, and a steak and egg dish with a twist. 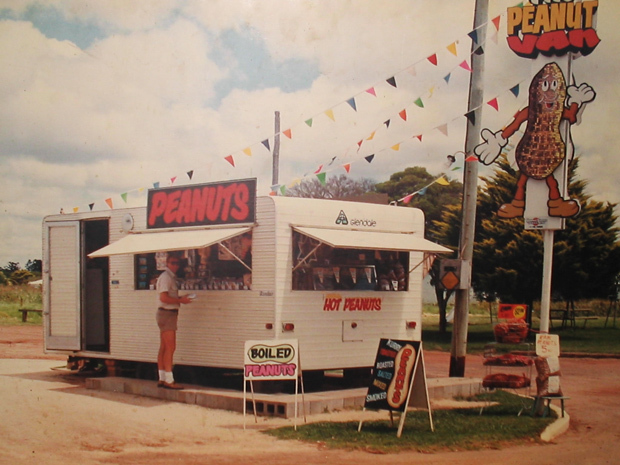 The Peanut Van’s history dates back to 1969 when Kingaroy resident Ruth Davis began working for the local Arnotts factory which was selling peanuts as a sideline from an old Murrumba Star caravan. Ruth bought the van and business for $100, renamed it and later moved it to its present site in Kingaroy Street. The Peanut Van quickly became Kingaroy’s unofficial tourism information centre. Ruth used to print up free town maps at her own expense for visitors. In 1991, the van was a winner at the inaugural Fraser Coast South Burnett Tourism Awards and was later entered into their Hall of Fame. Local peanut growers Robbie and Chris Patch bought the van off Ruth in about 1998. They expanded the business and the product range, and began selling peanuts online across Australia and internationally. They were one of the first South Burnett businesses to have a website. Over the years, the couple opened other van sites in Childers, on the Sunshine Coast and in Brisbane. These days The Peanut Van has a strong presence at markets around south-east Queensland as well as operating roadside vans in Kingaroy and Childers. They also market flavoured peanuts into IGA supermarkets. Fry onion and red chili in peanut oil. Add ginger, carrots, pumpkin and chicken stock. Simmer until all ingredients are cooked and tender and then add tomato juice, peanut butter and sugar. Bring back to the boil, season and then blend until smooth. Serve with a dollop of natural yoghurt and chopped peanuts. 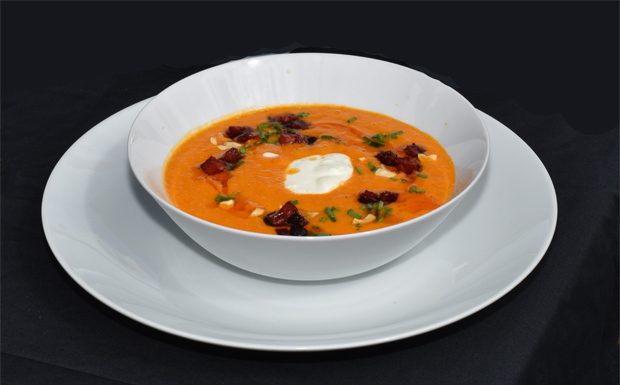 Footnote: For some added flavour, fry some chorizo sausage, chopped into small cubes, and sprinkle on the soup like croutons. Combine cold water and gelatine and mix to a smooth paste. In a saucepan add cream, sugar, peanut meal and peanut paste. Warm over a medium heat until sugar has dissolved. Do not boil. Remove saucepan from heat and add the gelatine mixture. Cool the cream mixture to room temperature. Add the buttermilk and vanilla essence. Divide the mixture equally among ramekins or dariole (cylindrical) moulds and refrigerate overnight to set. Cut assorted soft fruits (eg mango, kiwi and strawberry) into 1cm cubes and spoon over panna cotta to serve. Happy 50th Anniversary to ‘The Peanut Van’… a true South Burnett Icon!